Mike Gurstein’s excellent recent blog post poses a meaty question: how can information technology and digital policy speed Canada’s transition to a more just and sustainable economy? How do we bring geeks — including Canada’s tech sector, digital rights activists and social innovation scene — to the Leap? “There’s a notable gap in the Leap Manifesto which bears examination,” Gurstein writes, “and that’s the absence of any reference to the internet or digital technologies.” So, in true open source fashion, he proposes a remixed version of the document that weaves these elements in. “The early vision of the Internet as the foundation for a distributed economy, egalitarian society and broad-based participative democracy directly parallels (and I would suggest influences) the Leap Manifesto vision,” he writes. Canada will soon get a new national broadband strategy and innovation agenda. Could the Leap Manifesto provide a guiding vision and framework for both? Gurstein’s call for digital and social movement collaboration comes at an important moment: Canada’s digital policy and innovation agenda are at a crossroads. Our new Minister of Innovation is conducting a national innovation policy review, and the head of the CRTC has called on Ottawa to deliver a (long overdue) national digital strategy. Both of these are opportunities to bring the bold proposals for infrastructure investment, equity and sustainability the Leap advocates — and to consider how the two movements can collaborate. That collaboration isn’t necessarily obvious or easy; many in the environmental and social justice movements are wary of “techno-fetishism” — including dangerous proposed technological “quick fixes” to the climate crisis, or suspect claims about the “sharing economy.” But Gurstein’s remix of the Leap invites something different. By weaving technology into a broader vision for an economy based on caring for the earth and one another, it paints a more holistic picture of the role innovation could play in Canada’s economic transition. First Nations communities like Ontario’s Fort Severn have lead the way with community-developed internet, mobile phone, telehealth, distance education and videoconferencing services. Fighting similar battles. Digital rights activists, open Internet advocates like Open Media, and even Canada’s tech titans have been outspoken opponents of restrictive trade deals like the TPP — which (in addition to threatening made-in-Canada environmental measures) would restrict free expression online, impose draconian copyright rules, and make it harder to protect Canadians from snooping by agencies like the NSA. Infrastructure. Canada desperately needs investment in infrastructure — and that includes digital infrastructure. Too many Canadians still languish on the wrong side of a digital divide, with residents in remote Northern communities paying up to $1000 a month just to run their businesses. Universal broadband access would create jobs, strengthen rural and remote economies, and bolster education, health and social services — the very “low-carbon sectors” of the economy we need to grow. First Nations leadership. Indigenous communities have lead the way in creative use of digital communications to retain connection to their land and wider world. First Nations community broadband models (like Ontario’s K-Net) provide an inspiring model for the rest of Canada to follow, showing how locally run networks can work — for broadband today and renewables tomorrow. It’s crucial that traditionally excluded voices like these shape Canada’s digital and innovation agenda. Too many of Canada’s tech conversations are overwhelmingly white, male and corporate. Bringing diverse constituencies together around a set of digital and innovation policies — connected to a larger vision for a more connected, innovative and sustainable future — can bring fresh perspectives to the table, plus help everyday Canadians understand why wonky digital and innovation policies actually matter. Digital infrastructure. Canada needs investment in public infrastructure — including investment in 21st century infrastructure like broadband and next-generation networks. High-speed rail, transit and digital networks — all powered by renewables — can connect and energize the country, creating thousands of good jobs in the process. Universal broadband access. Affordable internet access is now a basic 21st century necessity. Ensuring high-speed internet access for all Canadians would increase civic engagement, bolster access to education, health and public services, reduce travel and commuting, and bring jobs to rural communities. Local control over networks. The Leap calls for local community control over their renewable energy systems; local control over community broadband networks can compliment this shift, providing the communication, sensing and remote management needed to make local energy management work. Digital equity and leadership for First Nations. Access to digital knowledge and communications must be treated as a basic right for all. Community-based networking models from First Nations communities can provide a model for the rest of the country to follow. End harmful trade agreements. 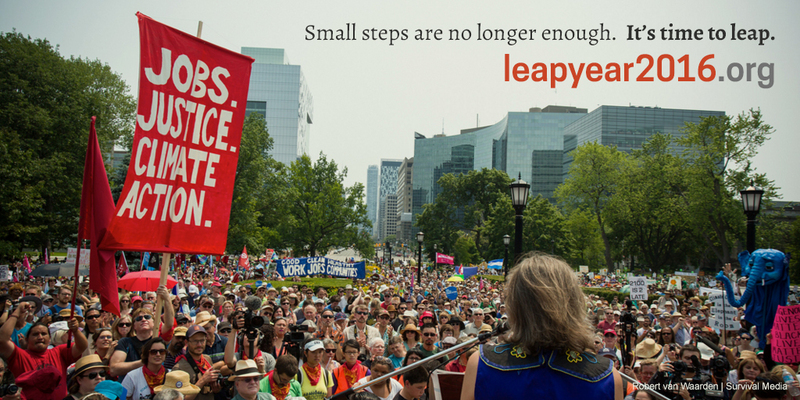 The Leap opposes trade deals that interfere with rebuilding local economies, regulating corporations or stopping damaging extractive projects; in the same vein, we must reject deals that restrict Canada’s digital sovereignty, threaten open internet governance, impose unfair copyright rules, or make it easier to spy and violate Canadians’ online privacy. Migration. Smart use of digital and other technologies (like delivering computers to arriving Syrian families) can help migrants and refugees reconnect with friends and family and settle into Canada’s social and economic life. Expanding low-carbon sectors. Existing low-carbon sectors — like caregiving, teaching, social work, child-care, the arts and public-interest media — can all benefit from the tools, resources and increased access that information technology provides. Smart power grids. New energy monitoring technology can make our electricity grids smarter and more efficient. Canada could get 100% of its electricity from renewable resources within two decades — and digital technologies can help, providing real time information on energy use, production and efficiency. Challenging austerity and monopoly. Much of the “austerity” approach the Leap challenges is mirrored in the stance of Canada’s phone and cable monopolies, who treat Internet access as a scarce and costly good when, in fact, modest investment could ensure low-cost access for all. National town-halls and local decision-making. The Leap calls for an ongoing national debate. Smart digital tools (like Loomio, DemocracyOS and numerous social platforms) could massively increase the transparency and effectiveness of that conversation and local decision-making. OpenMedia has already crowdsourced a national digital strategy, policymakers regularly use “GitHub for government,” and Mexico City is crowdsourcing its new constitution. Why not crowdsource Canada’s innovation and just transition plan? Innovation Minister Navdeep Bains says he’s committed to clean tech and a “holistic approach” for Canada’s new innovation agenda. “We could work with others towards a ‘People’s Digital Strategy,’ where the Leap and environmental issues are woven in as a necessary component,” Gurstein proposes. For me personally, that’s the kind of thinking Canada’s technology and innovation sector need right now. As anxiety about tech-fueled inequality and job losses continue to grow, it’s crucial that we connect innovation to a larger environmental and economic ethic of sustainability and social purpose. Otherwise, all the happy talk about “disruption” and “innovation” can easily end up perpetuating the very inequality, joblessness and extraction (of both people and planet) that got us into this mess. By the same token, tying innovation to a broader vision for a smart, equitable and zero-carbon future could re-inspire those of us who were so excited about the democratic potential of the open internet in the first place. Got ideas? Interested in taking this conversation further, or contributing towards a “People’s Innovation Plan” for Canada? Join this newly-formed newsgroup to share ideas, links or just say hello.